Aid groups planned to launch an emergency vaccination campaign in Port-au-Prince, Haiti, on Monday in a bid to ward off measles, diphtheria and tetanus. 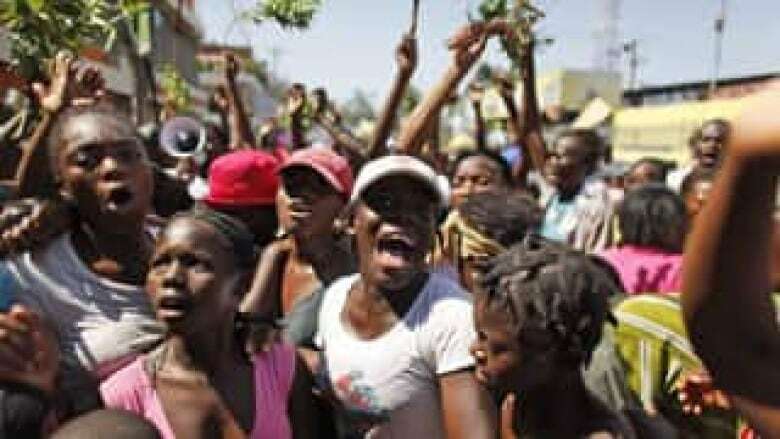 Earthquake survivors demand food in the streets of Port-au-Prince on Sunday. ((Javier Galeano/Associated Press))Aid groups planned to launch an emergency vaccination campaign in Port-au-Prince, Haiti, on Monday in a bid to ward off measles, diphtheria and tetanus. Starting with about 1,800 people at a camp on the old airport runway in the Haitian capital, the international Red Cross federation, the World Health Organization, UNICEF and the Haitian Health Ministry hope to vaccinate about 140,000 people in the earthquake-ravaged country. The Red Cross campaign will focus on Port-au-Prince because the disease risk there is greatest. From the airport camp, the campaign will move on to hundreds of other camps over the next two weeks. Thousands of Haitians are living in makeshift camps because their homes were destroyed or too badly damaged to inhabit. The 7.0-magnitude earthquake on Jan. 12 left an estimated 200,000 dead.